Sheenagh draws the focus in tight too, examining the ageing process in poems like Terra Nova and Catching Up, and the aftermath of death itself in Travelling With Ashes. Yet there’s no sentimentality or regret in lines like “and the sunlight’s morse sent answering flashes/ off broken windscreens, a code he once knew”, simply an awareness that this is what comes to us all – so all that remains is the minutiae others can conjure up in memory. Medals paints a picture of a military career in the most tender terms, with each stanza named for a different medal and location, telling a different chapter of a life. Other poems highlight the moments we’ll recall forever: a wedding nights in an ice hotel (there is a lot of ice, snow and fog in this collection), encounters with raw nature, and, unexpectedly, an homage to a bronze statue. Sheenagh seems to be reminding us, I think, that every detail can be important, if we choose it to be. The normality of the phrasing is an elegant touch in such an extraordinary circumstance, and clarifies my impression of what this collection is about – not just the wonder of life, but a thrill at its brevity. And as the poet shares her joy in the transience of things, that title seems more apt than ever. Our time here may be fleeting, but if we turn a fierce enough gaze on our time, it will cast a long, enduring shadow. 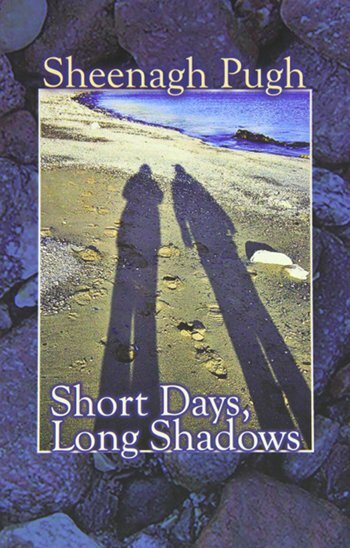 Short Days, Long Shadows by Sheenagh Pugh is published by Seren Books and available to buy from Amazon. This entry was posted in Reviews and tagged Long Shadows, poetry reviews, Seren Books, Sheenagh Pugh, Short Days by Judy. Bookmark the permalink.